Safran Electronics & Defense offers flight data management solutions and flight data analysis services to enable airlines and aircraft operators to automate the use of their flight data recording and to provide accurate and customizable information that improves the vision support. Based on our flight data acquisition unit or any unit available on the market, Cassiopée for airplanes allow to decode, cleanse and sort operational flight data and improve their readability by combining them with external data. 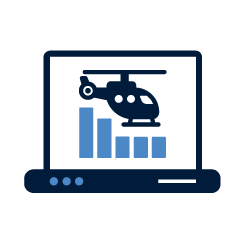 Our flight data analysis services helps improve flight safety (FDM / FOQA), reduce fuel consumption and optimize maintenance with dashboard decision support.